Notes: Data are from 2016. Totals may not sum to 100% due to rounding. Tax Credit Eligible share in expansion states includes adults in MN and NY who are eligible for coverage through the Basic Health Plan. Medicaid/Other Public also includes CHIP and some state-funded programs for immigrants otherwise ineligible for Medicaid. 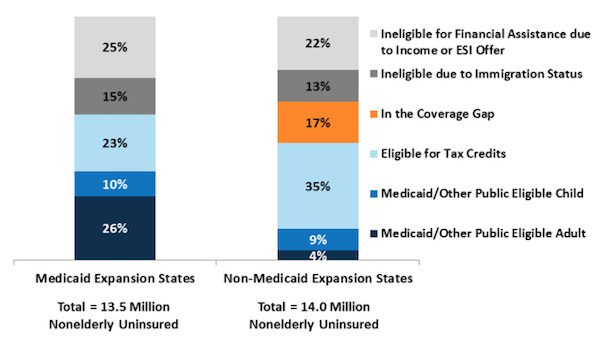 Data Source: Kaiser Family Foundation analysis based on 2017 Medicaid eligibility levels and 2017 Current Population Survey. This entry was posted in Data Watch on November 1, 2017 by Genevra Pittman.